The end was not triumphant, but it didn’t have to be. Lindsey Vonn already had her place in history. Yet with bronze on the Swedish slopes where she won her first championship medals, Vonn added polish to her concluding chapter as an elite athlete — becoming the oldest woman to secure a medal at a world championships and only the fourth skier to win a medal at six world championships. She also equaled Christel Cranz and Annemarie Moser-Proll’s record of five women’s downhill medals at world championships. Going out of the gate third, the American had set the early pace, raising her arms and bowing to the fans in the packed grandstands who burst into raucous cheers on seeing the 34-year-old’s name on top of the leaderboard. American, Norwegian and Swedish flags were raised as supporters of many nationalities showed their recognition to a woman who has transcended her sport. As she waited at the finish line, Vonn looked on in disbelief, perching forward in her chair and covering her mouth with her hands, as racers tried and failed to surpass her time. 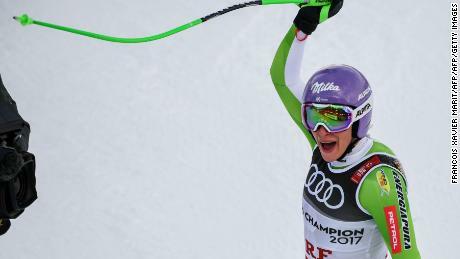 The Slovenian’s time of 1:01.74 ensured she became the first skier to successfully defend the women’s downhill since Maria Walliser in 1987 and 1989, while Switzerland’s Corrinne Suter followed to deny Vonn silver. She will retire five wins short of Ingemar Stenmark’s record of 86 World Cup wins, a statistic which will no doubt irk such a driven individual when she reflects on her remarkable career. Perhaps, too, she will wonder about those injury-lost years. How many more races and medals would she have won had injuries not denied her time on the slopes? Stenmark was in the Swedish resort of Are to watch Vonn’s final race and the American wore a white, blue and yellow race suit as a nod of recognition to the Swedish great. It was also an indication that the record she had been chasing is never far from her thoughts. The injuries she has sustained throughout the years read like a list doctors have to contend with in emergency rooms: a broken right arm, fractures in the left knee, broken left ankle, torn ligaments, broken bone in right leg, concussion, bruises, cuts. After the crashes and the falls — even after she was helicoptered off a mountain during training at the 2006 Turin Olympics — she has always recovered and carried on. 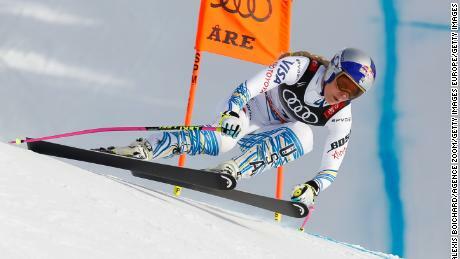 But now, with her knee permanently damaged, the woman described this week as a “warrior” by her compatriot and former Olympic champion Bode Miller had to call it a day.